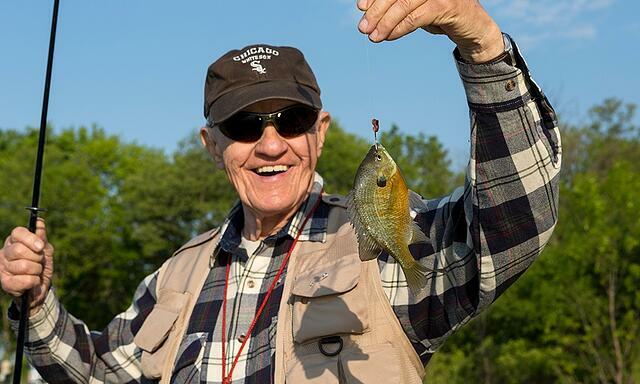 Bring your gear and drop a line in all DuPage forest preserve lakes and along both branches of the DuPage River, Salt Creek, the Des Plaines River and all tributaries unless posted. Anglers 16 or older who are not legally disabled must carry valid Illinois fishing licenses (inland trout stamps, too, if they're fishing for trout). You can buy licenses at sporting goods stores or through Visitor Services at 630-933-7248 or 3S580 Naperville Road in Wheaton Monday – Friday 8 a.m. – 4 p.m. Complete forest preserve rules and regulations (including creel limits and minimum lengths) are included in our Fishing Guide (PDF), which also has the lake maps from the chart below and stocking reports. You can request a printed copy from Visitor Services at 630-933-7248. You can ice fish on most forest preserve waters, but rangers do not monitor ice conditions; you go on the ice at your own risk. As a guideline not a guarantee, a minimum of 4 inches of ice is recommended for any activity. For current fish consumption advisories, visit the Illinois Department of Public Health website. The Forest Preserve District has found nonnative, invasive zebra mussels in five lakes at four preserves: Deep Quarry and Bass lakes at West Branch, Mallard Lake at Mallard Lake, Eagle Lake at Hidden Lake, and Sanctuary Pond at Blackwell. You can help stop their spread no matter where you boat or fish. Read our Fishing Guide (link) with handy maps and stocking reports online.